Equipment description: this equipment is mainly for electrical and electronic products, as well as its components, and other materials under high temperature, low temperature, damp and hot environment of storage, transportation and use suitability test. IT is mainly used for the product according to the national standards or set requirements, users under the condition of experiment, the characteristics of physics and other related products environmental simulation test, and to judge the performance of the products, whether can still meet predetermined requirement, so that for product design, improve, identification and factory inspection. 3. This equipment adopts the standardized multi-functional design, the program runs and constant operation function .Main controller USES the south Korean import temperature and humidity control instrument, special touch screen LCD display, communication interface, large capacity, simple operation, the user can custom curve of temperature and humidity control for temperature and humidity test. It has heating, cooling, humidification, dehumidification independent, unique way of wet BTHC equilibrium temperature and timing function. 4. Import taikang compressor refrigeration system adopts closed, mechanical single stage refrigeration or complex overlapping cryogenic loop system, automatic control and safety protection coordination system. Stainless steel, nickel chromium plate shape electric heater (small overshoot) external humidification way humidification system, when making low temperature without water, easy to implement and humidity control. Setting precision: plus or minus 0.1 ℃ temperature humidity plus or minus 1% R.h. Instructions precision: plus or minus 0.1 ℃ temperature humidity plus or minus 1% R.h. Looking for ideal Constant Temperature and Humidity Test Chamber Manufacturer & supplier ? We have a wide selection at great prices to help you get creative. All the Constant Temperature and Humidity Tester are quality guaranteed. 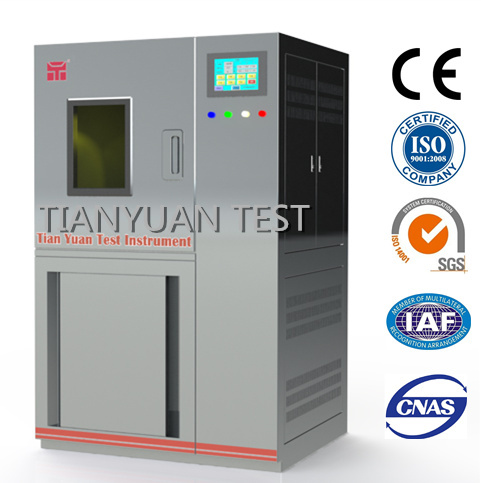 We are China Origin Factory of Constant Temperature and Humidity Test Cabinet. If you have any question, please feel free to contact us.